Working from my beach blanket day sketch I did on location at the Fort Lauderdale beach, I finished this pen and ink with watercolor painting today. I decided to use pen and ink first and then add the watercolor. After viewing the composition I went to a vertical format. I kept everything in a fairly light value in the background and stronger warm values in the foreground. I was using a smoother watercolor paper so I could use pen and ink. The colors I used for the people were cerulean blue, cadmium red and raw sienna. Using those 3 colors in different strengths I could get a variety of skin values. I added spatter at the end for more texture. This was fun to paint as I was working from my plein air sketch from Nov 7 blog post here. 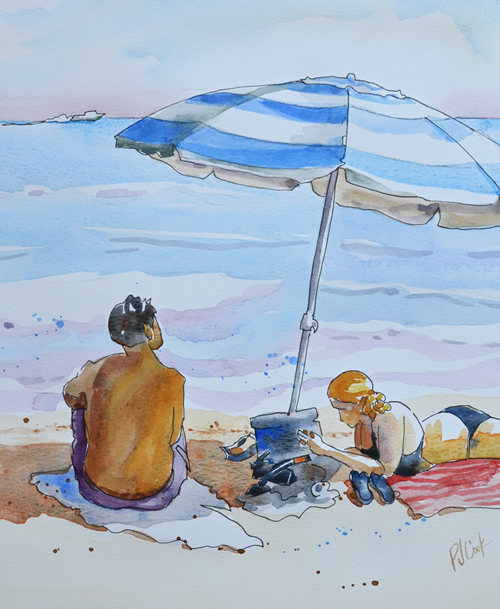 My goal in this Beach Blanket Day watercolor was to simplify everything I saw in front of me into interesting shapes. I liked very much your sketch and painting about people in the beach. Thank you for your explications very need to me. Hi Mercedes, Thanks, I am glad that you learned something from my sketch at the beach. Wait till you see my next post on painting with a stalk of kale! Thank you Sally! Be sure to click the “Painting Lessons” under Categories in the right sidebar. All the painting techniques and tips posts will come up. Be sure to check back for new posts and follow me on instagram @pjcookartist. I’m happy to have found your site! Your instructions seem to just sink into my understanding. Thank you, PJ! Thanks for taking the time to leave a comment! I’m happy that some of my painting tips have helped you.